Yes, complex regional pain syndrome, I think I saw a picture like that on Medscape, GREAT QUESTIONS!!! C, CRPS/ same as Sudeck’s Atrophy, Shoulder Hand Syndrome or Reflex Sympathetic Dystrophy. Supported by age, chronic history of tendinopathy, swollen hand and tenderness to touch. You may argue that this may be common to every other option. But there is something unusual in the other options. Schleroderma – why is it causing swelling rather than tightening of skin? Raynaud’s Phenomenon – why is it causing swelling? Acute arterial occlusion – why would it cause swelling? Carpel Tunnel Syndrome – why would it cause palor and cold hand? Compartment Syndrome – why is the examination missing pain on movement? (Flexion for hand Compartment syndrome & Extension for Antebracheal Compartment syndrome). It’s so easy to pick in Compartment syndrome – Pain exagerrated by movement. Perception of pain from a non painful stimulus (allodynia) or an exaggerated sense of pain (hyperalgesia) or a proportionate degree of pain to an insidious injury. International Association for the Study of Pain IASP diagnostic criteria for CRPS, after ruling out other causes of allodynia and hyperalgesia like cellulitis (the affected area is not cold), burn and compartment syndrome, the presence of sudomotor changes, continous pain and disproportionate tenderness are diagnostic of CRPS type 2. Some of us will say that pain can be disproportionate in Compartment syndrome and tenderness is a feature of it too or this might be a proportionate degree of pain to an insidius burn injury, IV accident or snake bite. Lol And this might be palmer tenderness. If it will be any counsel, If this patient elicited pain on movement, to me, that would be diagnostic of Compartment syndrome. Then I would perform fasciotomy. (Benefit of doubt, his pain might not be disproportionate after all and fasciotomy will save a limb) I would think of IV or A-line induced Hand compartment syndrome or burn or prolonged pressure or an insidious injury. More details on Compartment syndrome of the hand – presents with ; hypoesthesia of volar surface of fingers, tenderness in the palm, weakness of thumb opposition and limited flexion, pain with passive extension and flexion of the thumb. F. couldve been cause by Paget-Schoredder syndrome in a young patient. NOT CRPS-it has a completely different presentation and not acute onset. there is always an inducing event before CRPS. I really dont have an answer to this question. Its such a confusing questions, mainly because the data on CRPS is missing. I’ll just give some passing comments. CRPS, requires you to have at least some kind of initiating event. You can’t just have this syndrome out of the blue. Initiating events could be a nerve injury or a trauma that lead to immobilization. 1. Scleroderma : Yes, the GERD, and the tendinopathy(I am linking it to muscle aches as a whole) supports this dignosis. But, why a sudden swelling in hand? Maybe prolonged vasospasm? 2. Compartment syndrome: Requires some kind of trauma at least. 3. Arterial occlusion: Won’t have that swelling. 4. Carpel Tunnel: Not likely. Will have chronic pain/tingling. Its a neuropathy, not so acute. 5. Raynaud: Maybe but, with swelling? I am lost here. This is really a hard question!!! My fluke would be Arterial occlusion, since that is the only one that can happen out of the blue, and sudden! All the others require some form of initiating event. “chronic history of biciptal tendinopathy in his left upper extremity” could cause Type 1 CRPS. We once saw a patient like this in Orthopedics (months after a healed Colles fracture). She was referred to the Anesthesiology department and we managed her with regular follow-ups. answer is B, pt has GERD and bicepital tendonitis and is dev. raynauds syndrome. I have been reading these questions and responses for a long time now, and enjoy the questions and responses, and sometimes the banter between responders also. This is the first time I am actually leaving a comment about a question. Questions 162 and 161 deal with the same patient and condition. It seems to me that although there are some very poignant responses, there is focus on the hand alone. It is the presenting problem, but we have to look at the patient as a whole. The question made a point to mention tendinopathy and GERD. We should look at what causes all of the issues. According to Medscape, 70-90% of Scleroderma patients have GI involvement. Mostly reflux and progression of reflux over time to dysphagia and other problems. The tendinopathy is, I guess, throwing people off. Again, According to Medscape patients may have collagen deposition around or inflammation of the tendons. Now the hand itself, in Complex Regional Pain Syndrome, the hand does get swollen, and it may get hot or cold. But, in CRPS, the hand becomes discolored and you see changes to the skin and nails. The color changes go from white and mottled to blue or even red. 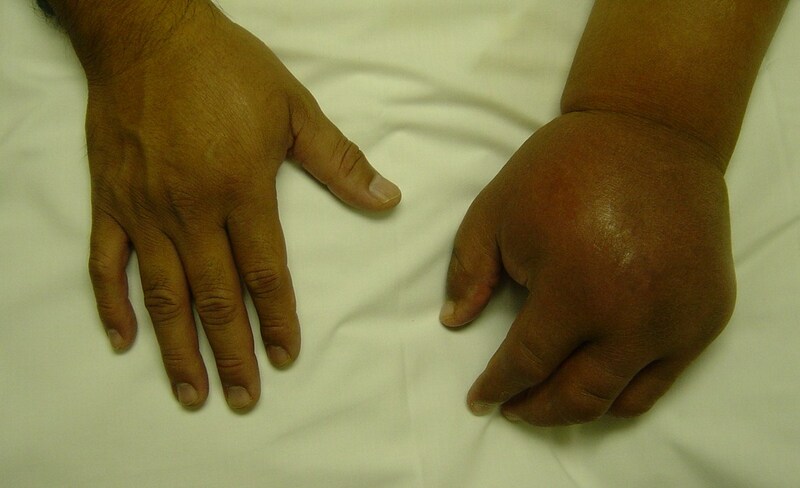 Looking at everything I am confident this is sequelae of Scleroderma. Thank you.